During the campaign trail the US president-elect referred to it as “the worst deal ever negotiated”. 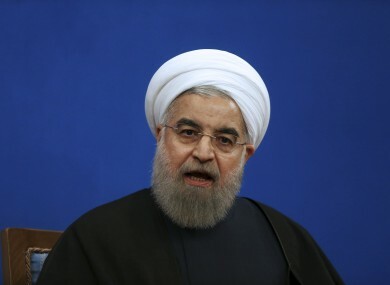 Iranian President Hassan Rouhani speaks in a press conference yesterday. IRANIAN PRESIDENT HASSAN Rouhani has said there is no chance of Iran renegotiating the nuclear deal reached in 2015 with world powers if US President-elect Donald Trump demands it. “The nuclear deal is finished, it has been approved by the UN Security Council and has become an international document,” said Rouhani at a news conference a year on from the deal coming into force. Trump frequently criticised the nuclear deal during campaigning and called for fresh negotiations, but has refused to be drawn on his plans since being elected. His nominee for secretary of state, Rex Tillerson, has called for a “full review” of the deal. “Mr Trump, the president-elect, has made various statements that the nuclear deal does not satisfy him, that it was not a good deal or even that it was the worst deal ever,” said Rouhani. “These are mostly slogans, and I don’t think that when he enters the White House, something will happen. It is not a bilateral deal that he can decide he likes or doesn’t like. He also referred to Trump’s statements over the deal as “meaningless”. The deal was signed between Iran, the US, Britain, China, France, Germany and Russia. EU and British officials have this week said they would not support any renegotiation of the deal, which places strict curbs on Iran’s nuclear programme in exchange for a lifting of international sanctions. Donald Trump will be sworn in as president of the US this Friday. Email “Iran president calls Trump's talk over renegotiating nuclear deal 'meaningless' ”. Feedback on “Iran president calls Trump's talk over renegotiating nuclear deal 'meaningless' ”.